The World Future Society’s annual conference, WorldFuture 2013: Exploring the Next Horizon, is taking place right now in Chicago. WorldFuture 2013 brings together the world’s premier minds to discuss the long-range future of science, technology, humanity, government, religion and many other topics. Speakers at this “World’s Fair of Ideas” include MIT Media Lab founder Nicholas Negroponte, visionary author Ramez Naam, Ford futurist Sheryl Connelly, and geosecurity expert John Watts. Keep up with the latest news from the conference on Twitter using hashtag #WF13. To celebrate WorldFuture 2013, we’re pleased to bring you the current top five most-read articles from World Future Review. With topics ranging from the future of jobs to a book review on agricultural biotechnology, these are sure to pique your interest. They are free to access using the links below through August 3. Please share and enjoy! The Last (Fertile) Man on Earth: Comedy or Fantasy? Do you have a paper to submit? The editors of World Future Review invite manuscripts from contributors worldwide whose essays fall within the broad spectrum defined as “futures research.” Click here for more information. 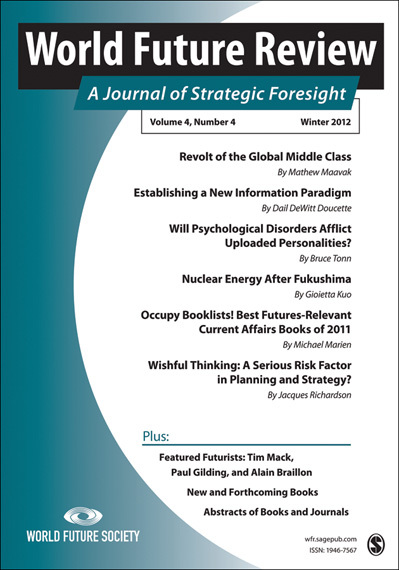 SAGE has been chosen by the World Future Society to publish its journal, the World Future Review (WFR), beginning in early 2013. The journal’s new home on the Web will be wfr.sagepub.com. WFR aims to further the study of future trends and better societal alternatives for researchers and practitioners alike. Its mission is to help people to live a more sustainable lifestyle by promoting research that fairly evaluates the outcomes of existing policies in multiple fields, assesses techniques for studying future issues, and allows for the exchange of futures-relevant information among different cultures. The articles published in WFR encapsulate the research of multiple disciplines from a futures perspective including sociology, political science, economics, management, and other social sciences. World Future Review is now accepting manuscripts from professionals across the globe. For more information, click here. The World Future Society is a nonprofit educational and scientific organization in Bethesda, Maryland, U.S., founded in 1966. The Society investigates how social, economic and technological developments are shaping the future. It helps individuals, organizations, and communities observe, understand and respond to social change appropriately and investigates the benign effects of applying anticipatory thinking to society www.wfs.org. The World Future Society’s meetings are unique, excitement-packed events. Since the First General Assembly in 1971, the Society has held a variety of small and large conferences that have brought together futurists from around the world to share ideas and vital information about the trends and events that will affect the world tomorrow. Society meetings provide an opportunity for people from many different fields to examine significant issues and discuss common problems. Each meeting has a rich variety of sessions and speakers, allowing registrants to sample a true cross-section of futures thinking. Past Society conferences have focused on topics ranging from energy, communications, and the global economy to crisis management and conflict resolution, work and careers, and education.